Mother loved to read historical romances. She would find them at the Goodwill for ten cents apiece and bring home a stack. On almost every cover, a handsome, rugged-looking man held a beautiful woman in his arms. Sometimes the man wore a Civil War uniform and held a woman in a billowing dress. Other times he wore a royal crown and cape while he embraced his queen. Ripped bodices were optional.The historcial context varied, but the story never did: the search for love ended in someone’s arms. 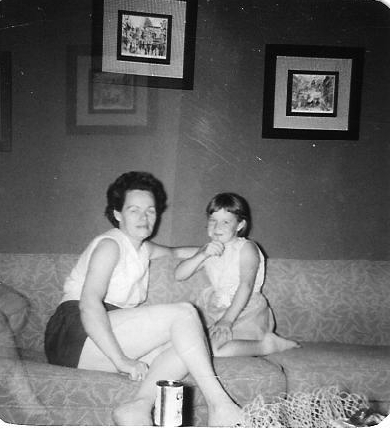 She often sat on the gray couch in the living room to read. One summer day, I sat on the arm of the couch by her while she drank her can of beer and read. It must have been a day like the one in this photo. She was wearing shorts and a sleeveless blouse. I could see the blue spider veins in her thighs as she stretched her legs out on the coffee table. I started reading the last words of each sentence to amuse myself and wanted to say something to her about it, but I didn’t want to disturb her. So I would read some of the words, then wait and listen for the soft slur of her finger on the paper as she turned the pages. I looked at her profile, her beautiful nose, straight and softly rounded at the tip; her lashes thick with mascara; and her lips, parted as if ready to sip from either her beer or her book; and I wondered if she even knew I was there. Immersed in her book, she had no idea that I was reading the words with her. Her books, I thought, must hold some secret, one that she needed to be reminded of over and over, one embrace after another. For the first time that I remember, I understood that we were completely separate beings, sharing the same space, our thoughts known only to ourselves. She knew nothing about the things my sister and I whispered while we were in bed at night, the forbidden sugar that I put on my cereal before anyone else awoke, and my fear of losing people. These and thousands of other thoughts belonged only to me. As I leaned on her arm and felt her warm skin next to mine, I realized that she, too, must have whispered things in the night to my father and done things in secret that no one else knew of besides her. Inside her head another world existed, one that I knew nothing about, that I would probably never know anything about. I felt like I had just awoken from a deep sleep in a strange room, not knowing exactly where I was. Everyone lived a hidden life, unknown to anyone else, and words were all that we had to find one another. We stumbled in the dark, calling out, searching for the other, reaching out, always reaching out. And sometimes, if only in books, we found solace in someone’s embrace. My head felt light and I wondered if I would fall off the couch. I leaned over, kissed mother on her forehead, and went outside into the sunshine looking for an adventure before the end of my childhood summer. Lovely and lyrical and true. It’s amazing to suddenly actually REALIZE that someone else’s mind is fully inhabited, and not fully known to others. I always thought of my baby sister as a kind of mini-me; we were very close, and despite a gap of eight years looked a lot alike. I pushed her to consider going to my own alma mater for college because I had had such a fulfilling experience and guessed that she would love it in the same way. Well, she did go to my alma mater, but she majored in biology, not English. At Dickinson College there are two ceremonies on graduation day; the Baccalaureate service, which was held in the sanctuary of the neighboring Methodist church (and I think still is), and the Graduation proper, held outside on the steps of the 18th-century building that anchors the campus (on rainy days, which my sister’s graduation was, Graduation is held in the student center and “extra” guests sit in another room and watch on closed-circuit television). Anyway. There wasn’t room for extra guests at the Baccalaureate, and I was content to let my parents attend that (“been there, done that,” I might have said, if the phrase had been invented yet) while I waited in my sister’s dorm room. Everything was packed up except for a bound copy of her Honors thesis; since I’m a compulsive reader, I decided to read that to pass the time. My honors thesis had been on a long poem by Dylan Thomas; her subject was a study of a flock of juncos wintering at the college’s nature preserve. Not really my thing, but something to read. And as I read, I heard a voice of hers that I had never heard before: serious, mature, poised, confident…scientific. Her SEPARATENESS, her COMPLETENESS, her SELF-ness, overwhelmed me, and I sat there on her bed crying my eyes out–not because I was sad, but because I was utterly thrilled. Your post brought that moment back. Thanks, as ever. RAB, you write so beautifully. You need to come on over to my blog sometime and write a post. Seriously. “..and went outside into the sunshine…With a book of matches, no doubt. You know me too well now! You portray this moment of awakening with such detail that I am there with you. Thank you for reading. I always consider it a gift when people read my posts. I can’t begin to tell you how much I enjoy reading your daily blog, I don’t get the time to comment as often as I should. I can relate to the things you write about – you make me laugh and cry with your wit and intelligent insights. Keep up the great work. Two questions: how do you find the time and inspiration to write everyday? And what does your blog name mean? Cheers! Thank you for reading; I’m so glad you enjoy the posts. First question: I get up early (between 4:30-5:00) and write before I leave for school around 7:15 or 7:30. I have a lot of writing on my computer that I’ve done in the past – essays, poems, and stories (fiction and nonfiction). Sometimes I take a poem and write an essay or story based on it. I like writing about my mom, and I have some transcripts from recordings she made about her childhood and a few things she wrote down. Other times it’s from something I read on the internet or that happened in my life. Second question: a phrase used in the past to talk about people of a certain age was “well stricken in years.” Stricken is the past participle of “strike.” I’ve always liked the phrase and the image it paints in my head. And I thought it explained how I look and feel as I get older – beat up by all those years. 🙂 So the blog is “year-struck” and I am yearstricken. I was going to call the blog “Her Dot-Age” because dotage refers to the mental decline of old age. I planned to use a lot of polka dots and claim the right to poke a dot if I wanted to. I think some of my wordplay is obscure and funny only to me, but it’s cheap entertainment and it helps keep me out of trouble. This was wonderful, thank you. I’m glad that you enjoyed it. Thank you for reading. What a beautiful post! I truly love your blog. And, I share your fear of losing people. Thank you for your kind words. It’s hard, that fear, isn’t it? No embrace is strong enough to keep them forever. You are exactly right, especially when they are ready to go. It is a tough fear to deal with because for people like us, that “wondering when, how and whom” is always front and center. It’s like that for me, anyway. Saying hello means eventually having to say goodbye:this is what keeps me from allowing people to get too close. There are more dead people that I love, than living people. There is something very wrong about that. It’s a dilemma. If you don’t embrace people, you will never know love; if you do embrace them, you will know loss. I’m so glad I found your blog. You are a gifted writer. I didn’t feel like I was back there with you, though. Instead I was back with my own mom and her book (and beer!). Such a gift you gave me tonight — time with Mom. I’m so glad that you could relive some of your memories of your Mom. How funny that she liked a beer with her book as well. Did she drink Coors? First your post, then RAB’s comment. This is why nothing is done . . . I know what you mean. I scan the want ads everyday looking for a job as a Blog Reader. None! It’s irritating. I could hardly take my eyes off the coffee table… see the crocheted doily with starched stand up ruffles? There was one in our house growing up. It was red and only used at Christmas. I absconded with it when mother’s things were being distributed. No matter how hard I tried I could not get it to ruffle. No friend or relative knew how to get it to ruffle either. I gave up, giving it to my daughter who has no idea what it is suppose to look like and probably threw it out. *sigh* A picture may be worth a thousand words but your words paint perfect pictures. Yes, that was the era of doilies. They must have been soaked in starch and left to dry – but how did they mold them? I need to ask Mr. Google; he knows just about everything. I vaguely remember something about sugar water(! ), but perhaps that’s what people put in those glass fly catchers. This post took me back; not to a moment of experiencing separateness but to my teenage years when I was much addicted to reading romantic historical fiction by Georgette Heyer. I think that it left me an altogether skewed notion of what the world was really like and I always get a jolt when I brush against life’s grim realities. Happy holiday. Love stories and love songs – the world can’t get enough of either one. The wild embrace that never ends may have been skewed, but you probably learned a bit of history along the way. I don’t remember a specific incident that brought me that realization, but there have been several times throughout my life when it has been acutely clear to me just how separate we are. On the one hand, I feel so connected to certain people, through shared experience, or likeness of thought or belief. And then I get reminded that I have no real idea of what goes on in their heads. There are whole lives lived in there, in our thoughts, that we don’t share: hopes and fears, dreams, ambitions, grudges and joys even. And then I wonder how it is that we think we really know people at all. How can we? We only know what we think of and about them. We are each a mystery. It’s like we are just peeking in on the world through our one little window and we can only see so much. There are millions and millions of other windows and people can see things we could never even dream of. Thanks for another beautiful look at life in its fullness. You capture something special every time. I love this post… and I am finding myself very attracted to your mother, too. I’m glad you liked the post. Many men found my mother attractive. There was something special about her. I appreciate your comments. I am always surprised, happily so, when my words speak to another person.